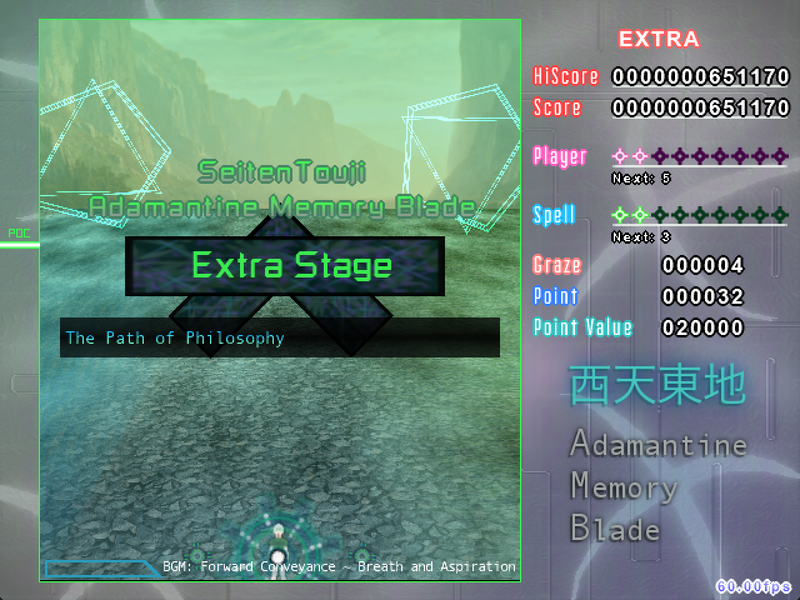 SeitenTouji 1 - Adamantine Memory Blade is the first game in the SeitenTouji series! The lead developer of the project is Andrew Fan, AKA Sparen of Iría, with Ghoulmage and FrenticPony as additional composers and AchySolrock and CK Crash/Onthenet as additional artists. This project was made possible by the support of the Touhou Danmakufu Community and runs using Touhou Danmakufu ph3 as its engine. Download the full game (v1.06) at Bulletforge. The C key may also be used for certain events (such as switching players in ExAttack Practice). In SeitenTouji AMB's main story and Extra Stage, you must dodge bullets and progress through the stages, clearing each boss. You start with very few lives, but by no-miss clearing a boss attack (no miss: bombing is allowed but dying is not), you can gain shards for extra lives. SeitenTouji's main 'gimmick' is the Piezo gauge, which is shown in the bottom left hand corner of the playing field. As you collect Piezo Shards, the amount of score you get per point item increases and the gauge fills. The gauge also fills when clearing bullets. Filling the gauge will reward you with one Bomb Shard (also called Spell Shards). These will accumulate to grant extra ExAttacks (AKA Bombs) for the player. Player Bombs can be used to clear the screen of bullets and deal significant damage to enemies. If you bomb within a very narrow timeframe of getting hit by an enemy bullet, you can trigger a Deathbomb, which prevents you from losing a life at the expense of one Bomb. SeitenTouji AMB features ExAttack and Stage Practice as well as a detailed story with dozens of skits between characters (under 'Omakes'). Omakes are initially locked and must be unlocked by clearing parts of the game, capturing spellcards, etc.